Established in the year 2010, MG Polyplast Industries Pvt Ltd was earlier named MGI Glass Pvt Ltd. It is today a leading manufacturer, exporter and supplier of Polycarbonate and PS Sheets in India. Located in Neemrana, Rajasthan, the company has its corporate office in New Delhi. Started with just one production line the company today possesses 4 advanced sheet extrusion production lines and one metalizing machine and more than 130 employees working. Our Polycarbonate Sheets come with a brand name of PC Lite and are produced and controlled by strict quality system and lab inspection ISO 9001:2008 standards. Right from roofing of over bridges to shopping mall, bus stop to swimming pool, green house to noise barriers, advertising to light ceiling, our PC Solid & PC Hollow Sheets are widely used in various applications. Our Polycarbonate Sheets come with a brand name of PC Lite and are produced and controlled by strict quality system and lab inspection ISO 9001:2008 standards. The plant in Neemrana covers 165000 square feet of land and is responsible for manufacturing PC Solid Sheets and Rolls, PC Multiwall Sheets, PC Embossed Sheets, Acrylic Sheet and PS Sheets. We only use virgin grade of raw material procured from various reputed companies overseas. Further, we are very pleased to announce that a new premise of 180000 square feet is under construction. We are the largest PS Sheets manufacturer in India with annual production capacity of 7800 M.T. PS Sheets are mostly used in Door/Window Panels, Displays, Sign Board etc. We also manufacture PS Embossed sheets which are used in Bathroom Portions, Shower Panels etc. Our Sheets comes in various Brand like MG, Euro Plast & Plastech etc. We also Manufacture Extruded Acrylic Sheets which comes in brand name of MG Acryl. MG Acryl flat extruded acrylic sheet offers light transmission that surpasses glass, but at only half the weight of glass. Inherently UV resistant, MG Acryl is an excellent choice for both indoor and outdoor applications. Its high clarity and formability offer designers a world of options, from small fabricated items and displays, to signs, railings, and more. Our newest addition is PS & Acrylic Mirror Sheets. We can produce the sheets and give them mirror finish in various colors like Silver, Red, Blue, Green etc. These sheets can be used in Displays, Interior Decoration, Shower Mirrors etc. In addition to various high quality products, we also boast on offering high quality service. Right from managing, placing to dispatching order, we utilize ERP system. We promise to offer you reliable after sales service and support system, regardless of whether you are our old or new customer. If you still have any queries or need additional information about our company, products or services then feel free to contact us at any time. Please find detailed information about how you can reach us by visiting our contact us page. High Quality:- For manufacturing quality products of international standards, high grade raw material is imported from world famous brands like SABIC, BAYER, LG , SUPREME, SUMITOMO & MISTIBUSHI. Quality assurance tests are carried out first, during production; thereafter, of the finished product, and finally when they are dispatched. Employee Safety:-MG not only pay attention to the maximization of customer benefits but also provides prosperous future to employees. Environmental protection:- MG is responsible to harmonious society and would like to contribute much to our bright future of human being. On Time Delivery:- We deliver when we promise. 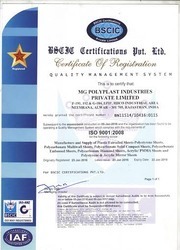 Not only producing quality products but also consistently maintaining the quality has earned MG Polyplast Industries the trust of Indian & Overseas clients with whom the Company has built a long term win-win relationship, CLIENTS REQUIREMENTS CAN BE MET THROUGH ITS SERVICE & through optimization and innovation products and management system. We are well supported by a team of experienced professionals who are highly responsible for manufacturing and supplying outstanding quality PS Sheets. Further, we have selected a panel of professionals on the grounds of their qualification, expertise and experience in their particular sphere. All our team members maintain close synchronization with our customers in order to understand their each specification and instruction. As a result, they provide suitable products to our customers at market leading prices. We are associated with reliable and certified C&F agents, who ensure us with reliable and safe deliveries of the product range. Our amicable relations with leading cargo and freight agents ensure timely delivery of consignments across the country. These services regarding fast and quicker deliveries helps us in being ahead of our competitors thereby ensuring complete customer satisfaction. Easy coloring and painting, simple processing. Odorless, tasteless, nontoxic, and insulating. Good mechanical performance crack resistance. We are in charge of manufacturing and supplying outstanding quality PS Sheets. The products we are offering are according to the various requirements of the customers.